Within Teamwork Projects, you can view all of your projects in a list view. Go to the Projects area at the top of your site, and select the List tab. If you have many projects they may have different statuses depending on where they are in their current timeline. Active: All projects on the site except any project that has been archived. Current: Any projects that are active, but not late or completed. Archived projects are excluded. 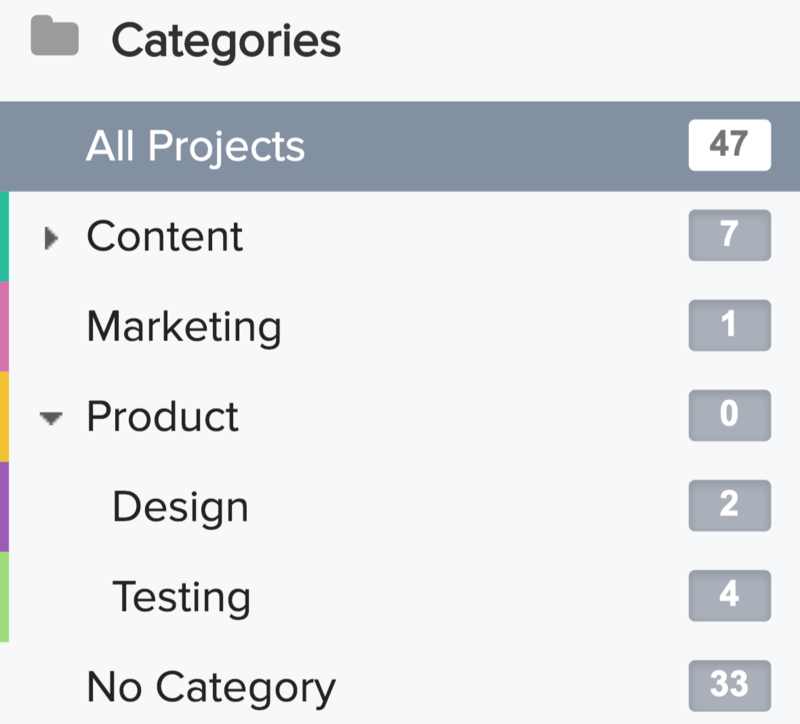 In the left pane, you can see a list of categories that you have created and the number of projects in each. If the sub-categories are collapsed/hidden - you will see the total number of items in the main category including any items in sub-categories under it. If the sub-categories are expanded/shown - you will see the number of items specifically in that top level category or sub-category. The number in the All Projects category will change to reflect the status tab (active, archived etc.) you are currently viewing. For example, if you are viewing the Late tab and you have 9 late projects, the All Projects category will have a count of 9.